You don’t have to be in an art gallery to find inspirational works of art. Head to the north of England to discover plenty in the great outdoors. There are many ways to view and appreciate works of art, but there’s something inspirational and liberating about walking among art in nature instead of in a crowded indoor gallery. 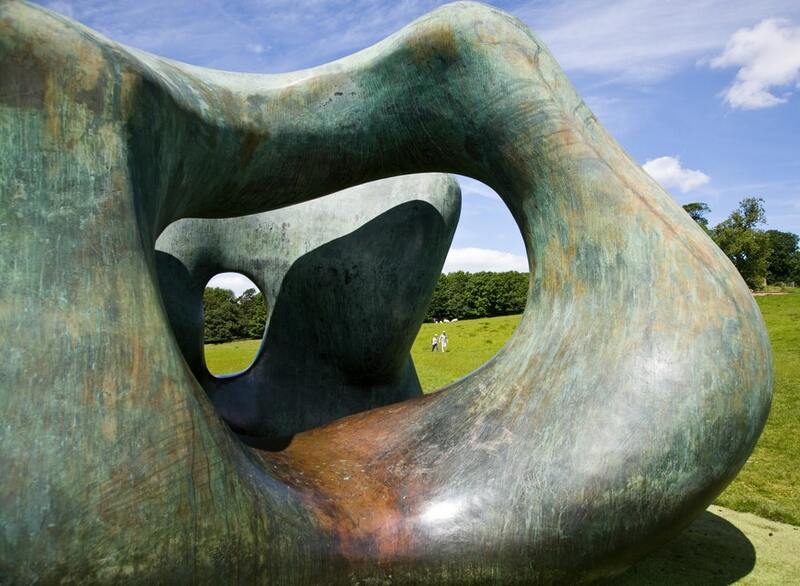 Henry Moore (1898–1986), a leading English artist of the twentieth century whose sculptures are synonymous with the landscape, said, “Sculpture is an art of the open air. Daylight, sunlight is necessary to it. I would rather have a piece of my sculpture put in a landscape, almost any landscape, than in or on the most beautiful building I know.” With this concept in mind, we visit the north of England, which is blessed with a selection of excellent art walks where you can discover sculptures in the great outdoors. “A great day out with or without the kids. Loved exploring and finding all the different artists.” “Space to be free with nature and have our eyes and minds opened.” These are just a couple of the comments from visitors to the Yorkshire Sculpture Park (YSP), winner of the Art Fund Prize for Museum of the Year 2014 and arguably the top outdoor gallery in the country. 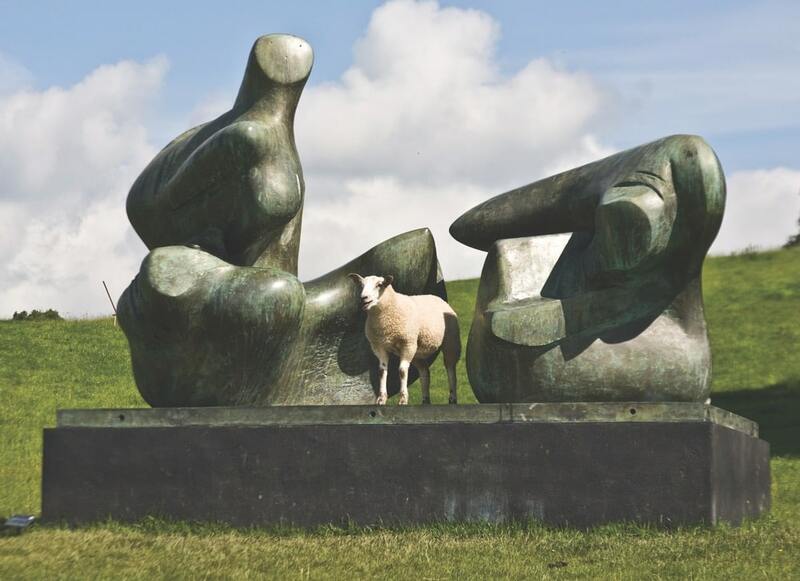 YSP is perhaps best described as the art world’s equivalent of a safari park, where over sixty sculptures are scattered across five hundred acres of historic rolling parkland on the eighteenth-century Bretton Estate. 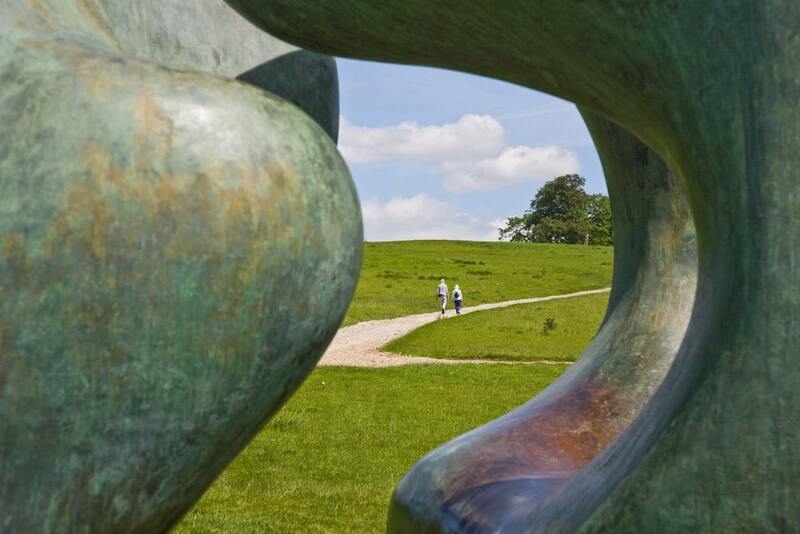 The park showcases the works of dozens of leading sculptors, both national and international, including Henry Moore, Barbara Hepworth, Antony Gormley, Jonathan Borofsky, Anthony Caro, and Andy Goldsworthy. 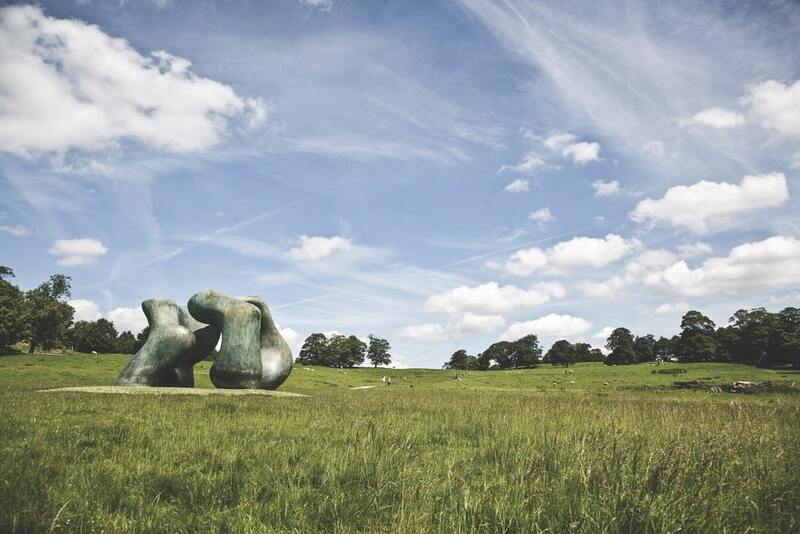 Several walking trails branch out from the YSP visitor center, and some of the many art highlights include Henry Moore’s Open Air Bronze Collection, Barbara Hepworth’s The Family of Man (on display at YSP for over thirty years), Seventy-One Steps by David Nash, and James Turrell’s Deer Shelter Skyspace. Adapted from a Grade II–listed shelter that would have originally provided refuge for the estate’s deer herd in poor weather, the Skyspace now creates a place of quiet contemplation and harnesses the changing light of the Yorkshire sky. Throughout the year, there is a diverse program of temporary exhibitions, artist talks, landscape tours, workshops, and family activities. Before you leave, don’t forget to visit the excellent gift shop to browse through its treasure trove of beautifully designed products. The park is situated eighteen miles north of Sheffield and twelve miles south of Leeds, just off Junction 38 on the M1 motorway. Created over the past thirty-five years, Grizedale Sculpture is the first sculptural concept of its kind, and the forest now holds around fifty permanent artworks by leading international artists in response to the landscape. The ten-thousand-acre Grizedale Forest in the Lake District is home to the UK’s largest collection of site-specific art in the environment. Created over the past thirty-five years, Grizedale Sculpture is the first sculptural concept of its kind, and the forest now holds around fifty permanent artworks by leading international artists in response to the landscape. 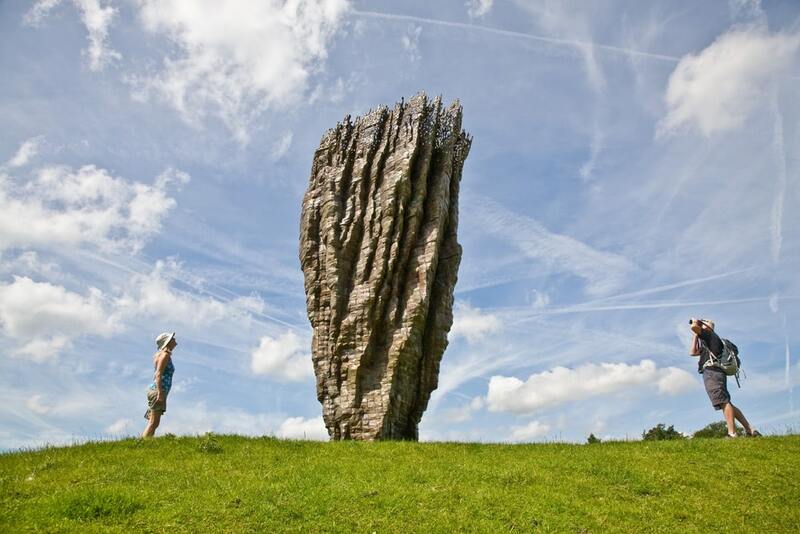 The first piece was made in the late 1970s by David Nash; since then, artists have continued to respond to the unique forest setting, creating site-specific works in a continually changing landscape. 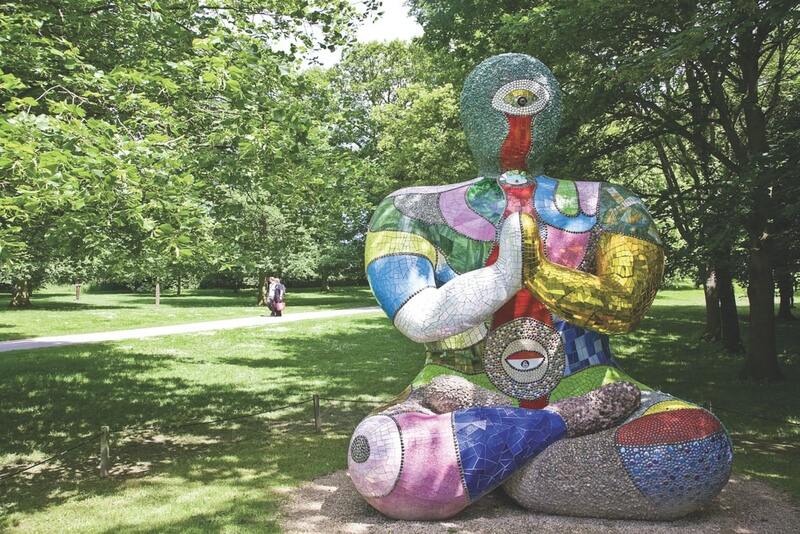 The sculptures can be visited using several popular walking and biking trails that crisscross the forest, including an all-access walking trail suitable for strollers and wheelchairs. A map of all the trails is available from the park’s visitor center or website, and the staff can advise on the best way to see the sculptures based on how long you have or whether there is a particular piece you’d like to see. Keep an eye out for Concrete Country by Lucy Tomlins, a two-and-a-half-meter-tall representation of a typical country stile. 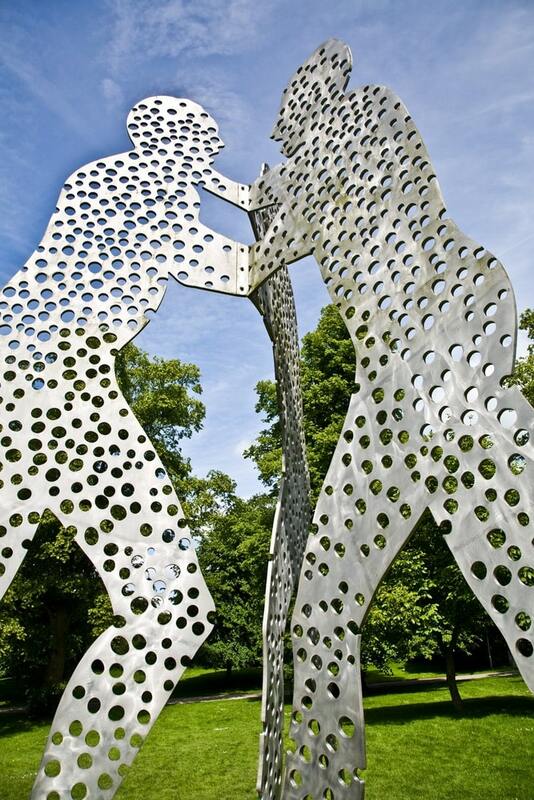 It was the winner of the Thirteenth Annual Battersea Park Sculpture Prize. Equally impressive is Romeo by Owen Bullet and Rupert Ackroyd, a carved oak totem-style piece that was inspired by the story of Romeo, an urban fox who explored the building site of the famous Shard tower in London, creating media headlines. He climbed to the seventy-sixth floor before being caught by an animal rescue team. Grizedale Forest also hosts temporary exhibitions and events. 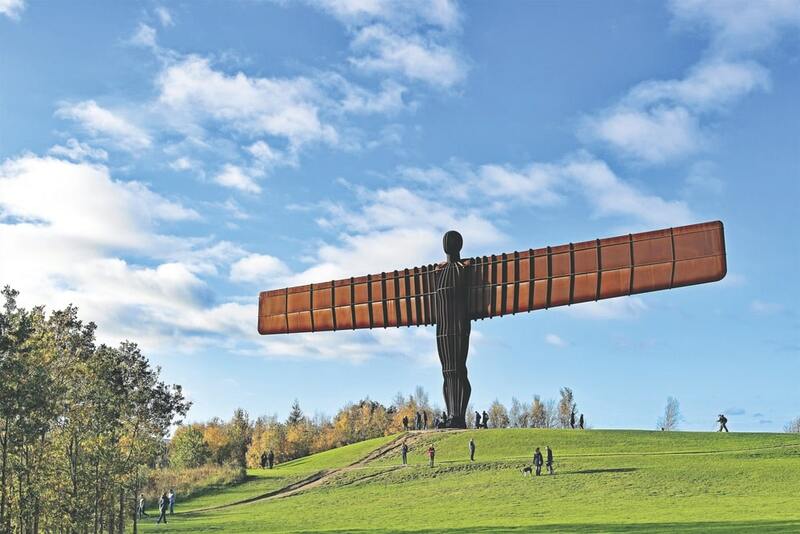 Looming large over the main A1 highway about five miles south of Newcastle is a gigantic statue of a human frame with wings—the majestic Angel of the North. At twenty meters high—the equivalent of four double-decker buses stacked—and with a fifty-four-meter wingspan that is almost the same as a jumbo jet’s, Antony Gormley’s best-known work is believed to be the world’s largest angel sculpture. Thanks to the number of passing cars on the A1, the Angel of the North is seen by about ninety thousand people daily, making it one of the most viewed pieces of public art in the country and possibly the world. To fully appreciate the sheer size and scale of the Angel of the North, it’s best to park the car and take the short walk up to its base where you will feel absolutely dwarfed. The sculpture weighs two hundred metric tons; there is enough steel in it to make four British Chieftain battle tanks. It can withstand winds of more than a hundred miles per hour, as its massive concrete base goes twenty meters deep to anchor the sculpture to the solid rock beneath. Angel of the North is made of special weather-resistant steel, containing a small amount of copper, which forms a patina on the surface that mellows with age. 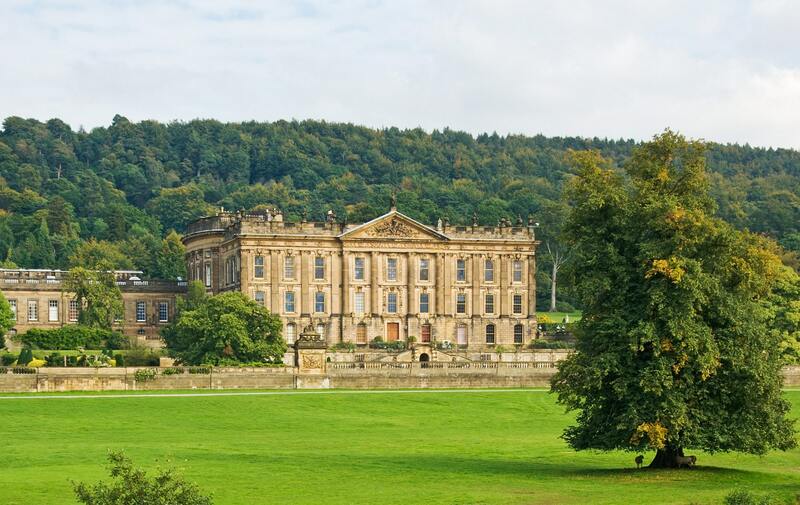 Situated in the heart of the Derbyshire Peak District and home to the Duke and Duchess of Devonshire, Chatsworth House is one of Britain’s most historic and recognizable settings, thanks to period dramas such as Pride and Prejudice and The Duchess. 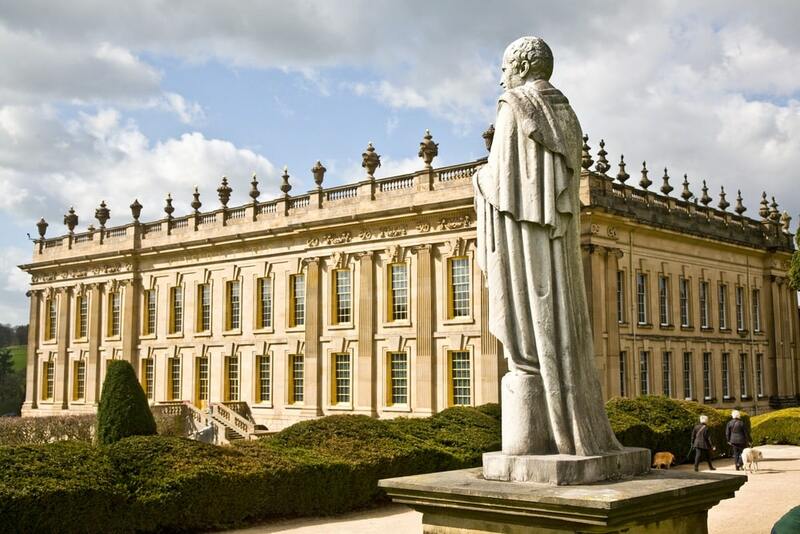 Although this magnificent stately home is fascinating to explore, the jewels of Chatsworth’s crown are the thousand-acre park designed by Capability Brown and the 105 acres of extensive gardens, which have been evolving for more than 450 years. In the garden, it’s not just about typical neatly clipped hedges and lawns: five miles of footpaths wind past cottage and rose gardens, a rockery, waterfalls, a maze, fountains, streams, and wooded glades carpeted with wildflowers. 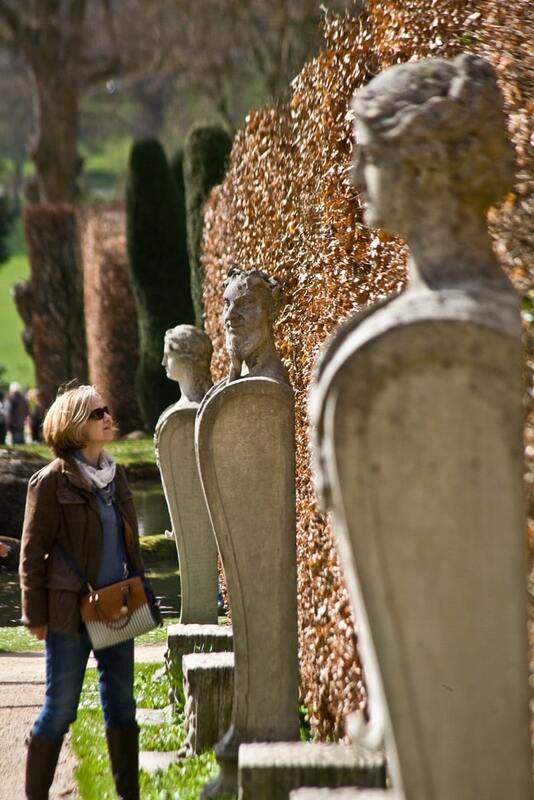 Sculpture is clearly a passion at Chatsworth, and over the years, the Duke and Duchess of Devonshire have commissioned dozens of pieces to be permanently sited within the grounds. While not an official sculpture park, Chatsworth could certainly qualify as one with its wealth of both classical and contemporary sculptures to discover, including Angela Conner’s bronze busts of the Cavendish family, woven willow sculptures by Laura Ellen Bacon, and the Lying Down Horse by Elisabeth Frink. Throughout the year, Chatsworth also hosts temporary sculpture exhibitions. One of the standouts in recent years was by conceptual artist Michael Craig-Martin, who installed a dozen giant sculptures of such commonplace objects as a red wheelbarrow, an orange umbrella, and a vibrant pink shoe; all were based on line drawings and appeared oddly two dimensional within the garden setting. Chatsworth has also been home to Sotheby’s Beyond Limits sculpture exhibition, showcasing around twenty monumental and original sculptures by various artists including Anthony Caro, Damien Hirst, Barry Flanagan, Thomas Heatherwick (designer of London’s Olympic cauldron), and one of China’s best known and highly acclaimed artists, Xu Bing. 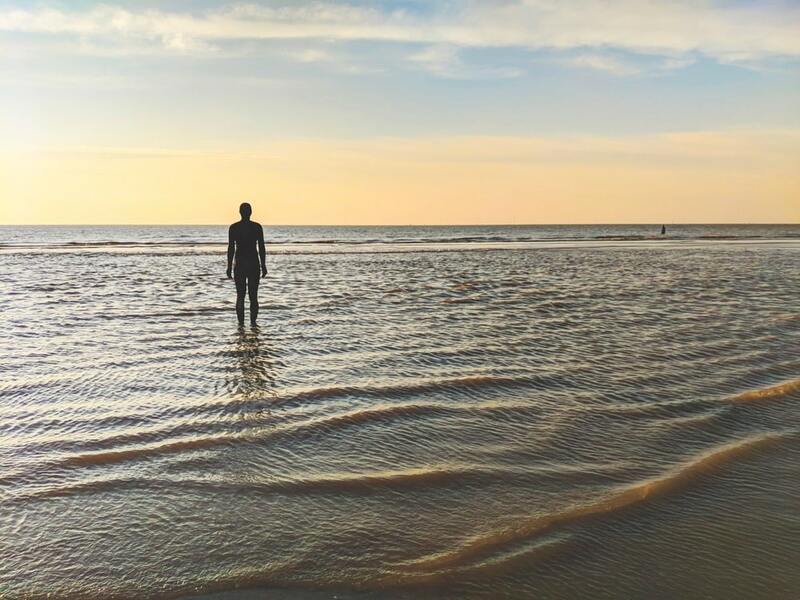 Situated six miles north of Liverpool on the Lancashire coast, the art installation Another Place, created by Antony Gormley, is no ordinary place. Standing spread over a two-mile stretch of foreshore at Crosby Beach are a hundred life-size cast-iron figures looking out to sea, staring at the horizon in silent expectation. According to Gormley, Another Place harnesses the ebb and flow of the tides to explore man’s relationship with nature, with the figures becoming submerged, then revealed, and weathered by the effects of sand, wind, and water. Walk along the beach to capture the overall views of the installation, interact with the figures, and appreciate them from different angles. Another Place is a dream for photographers—even the most inexperienced will capture good images here. Up close, the figures are vague in detail; some of them are rusty, while others are thickly encrusted with mussels and barnacles. One of the intriguing aspects of Another Place is that, because of the ever-changing tidal landscape, the installation looks different depending on when you go. At low tide, the majority of the figures will be visible; between tides, the sculptures could be waist high in sea water; and at high tide, they might not be visible. In addition to checking the tide times before you go, it’s a good idea to take appropriate footwear and be aware that it’s not safe to walk out to the farthest figures. For maximum impact, visit Crosby Beach either early morning or late afternoon in fine weather, when the sunlight will enhance the statues and make Another Place even more magical. Visit FoodGolfTravel.com to see more of Andrew Marshall’s adventures along with his brother and fellow photographer, Paul.